?Glasgow Rose? Longines, No. 4138629. Made circa 1930. Extremely rare and fine, 18K yellow gold and enamel keyless Art Deco dress pocket watch with cloisonné enamel dial after the ?Glasgow Rose? design by Charles Rennie Mackintosh. C. Three-body, the bezel, back, pendant and bow with black enamel, the winding crown set with a cabochon black onyx, the band in green enamel. 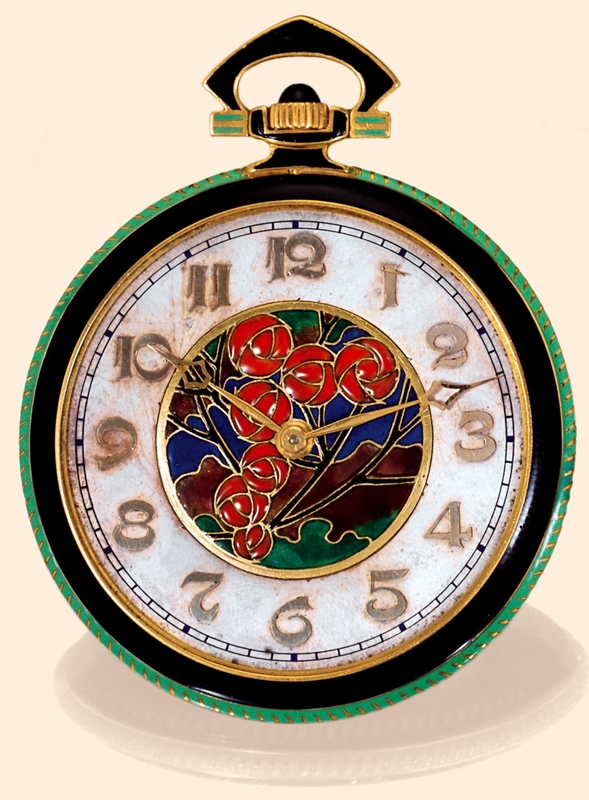 D. Polychrome cloisonné enamel central panel with Glasgow Rose decoration applied gold Arabic numerals on a silver chapter ring with outer minute track. Yellow gold Cathedrale hands. Charles Rennie Mackintosh (1868 - 1928) An architect, designer and artist, he was one of the most significant Art Nouveau artists of the 20th century. He was born, one of eleven children, in the Townhead area of Glasgow, close to Glasgow Cathedral. Mackintosh took his inspiration from Scottish traditions, blending them with the flourish of Art Nouveau and the simplicity of Japanese forms. For the 1902 International Exposition of Modern Decorative Art in Turin Mackintosh designed the ?Rose Boudoir? which used geometrically designed roses as the central motif, this type of rose became known as the ?Glasgow Rose? and is to this day is one of the most instantly recognised and frequently copied of Mackintosh's designs.